It's been ages since I've reviewed one of these boxes, but I've been receiving them now for more than a year and haven't quit yet. I love how they only arrive once every season, cost a mere $5 (including shipping) and are filled with drugstore products I can actually afford. As much as I'd love to splurge on the more high-end subscription boxes, I know this is more up my alley during this season of life, and I always look forward to seeing what is tucked inside! 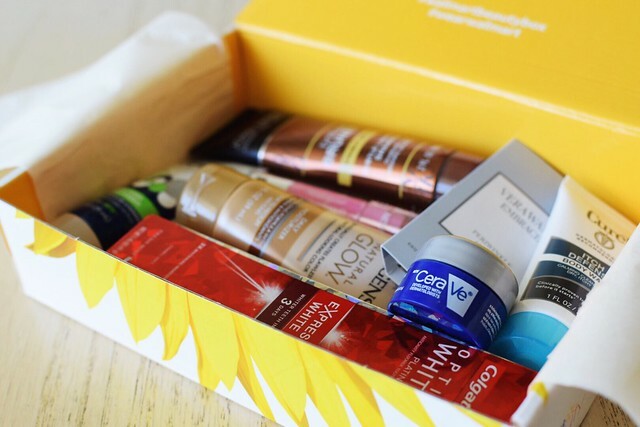 If you want to begin receiving this seasonal beauty box, you can visit the website here. As I mentioned before, they ship out four times a year—at the beginning of each new season. I feel like I should mention that I don't get anything if you sign up and this isn't a sponsored post—I'm just sharing the goodness because I've enjoyed receiving these boxes, and everyone I know who has subscribed has loved them, as well! It's so inexpensive, but it still feels like a little way to treat yourself four times a year. Yes, indeed. Biore Pore Unclogging Scrub — I've used so many random facial scrubs over the years, so this will be next on the list once I'm through using my current one! I like using samples for facial scrubs, face wash and body wash in-between using new, full-size products. You'd be surprised how much use you can get out of one of these samples…especially for a product like this. Vera Wang Embrace — This perfume smells wonderful. I rarely wear actual perfume (I typically stick with my go-to roll on) but I've already been wearing this sample almost daily. Neutrogena MoistureSmooth color stick — At first I wasn't sure I was going to like this lip color, mostly because I'm so used to a more glossy feel. This is definitely more of a lip stick as opposed to gloss, but after a few tries I'm totally hooked. I love this pink color, and it doesn't dry out my lips at all. I love that this sample is a generous size, and I'm assuming it'll last for quite some time. CeraVe healing ointment — I've never used this before, but it's definitely being added to my diaper bag for on-the-go. It works very well on my hands and I love to have an unscented option for this sort of product! Jergens Natural Glow moisturizer — I've loved this product for years. It's a summertime staple for this fair-skinned gal. When I get a bit of sun, I follow it up with this lotion for a few days, which makes it look like I have a borderline tan. Insert praise-hands emoji here! John Frieda Brilliant Brunette shampoo — When my hair was a bit darker than it is now, I used this shampoo for a while. It ended up costing more than I'm generally willing to spend on shampoo, but I did like how it made my hair shiny and soft. Curel Itch Defense body wash — I haven't used this brand of body wash before, and I'm not necessarily itchy, but hey! I'll add it to my sample stash. 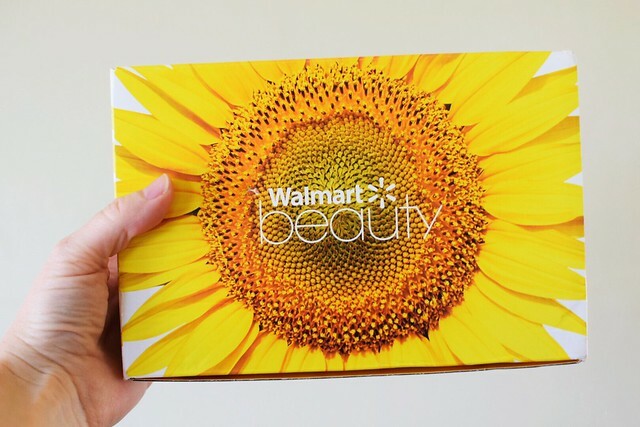 Additional single-use samples/coupons are included in each box, most notably a high-value coupon for $3 off Bert's Bees BB Cream (which I will totally try!). Overall, I'm very pleased with this season's box! In the past, many boxes have included a full-size product (mascara, razor, etc.) but there were so many good samples in this one that I'm willing to let it slide. 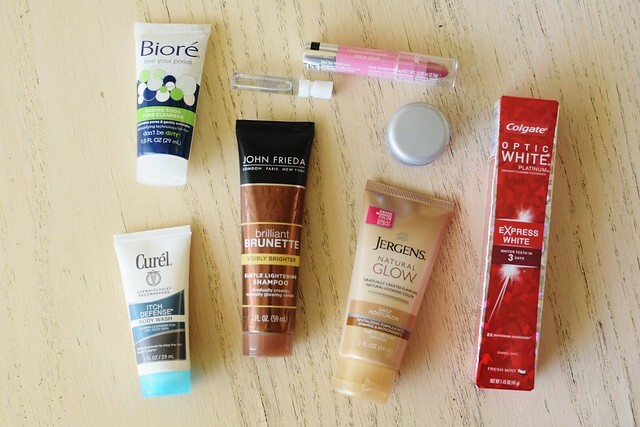 It is still worth the price to receive something filled with products I'll actually use. Did you receive one this season? You'll have to let me know what you think! I got this box, too, & was a little disappointed in it. I found the CeraVe to be greasy, & the lipstick is in a color that would look heinous on me, so I'm giving it to my best friend. But the box came in handy when my boyfriend was packing for his trip to Rome: I loaded him up with the body wash, the facial scrub, & the toothpaste. Voila! Set to travel. You got me hooked on this box over a year ago - love the price and what you get for it! Beginning with the spring box there is now 2 different boxes.... the classic and the trendsetter. The classic is geared toward older individuals and the trendsetter towards younger. I think they base it off your age on your account. If you want the younger box set your birthday to reflect you as being under 30. Hope this helps. That is so disappointing! :( I heard from someone else who had the same issue with their box and I think it's a pretty huge difference without those two items. I would have been annoyed, too. And like you said, I was surprised they included such a specific product in this box (brunette-specific shampoo seems like such an odd thing to include when sending to such a large demographic of people!). Hope you have better luck next time around, for sure!